Europe is in serious economic and demographic decline. It now only accounts for 19% of world GDP. By 2050, the figure will be 7% (Willem Buiter, Citigroup - March 2011). Even the European Commission itself admits that "Over the next ten to 15 years, 90% of world demand will be generated outside Europe." (Trade - Europa.eu). The EU Single Market, while still important, is of declining significance to us. The EU population is ageing and will be in absolute decline by 2050, whereas over 60% of the Commonwealth's 2.2 billion citizens are under the age of 30 (thecommonwealth.org). EU membership ties us to a declining economic block and holds us back from developing economic ties with more dynamic, faster-growing parts of the world. The UK does not need to be in the EU to have access to the EU Single Market. Switzerland, Mexico, South Korea - altogether more than 50 other countries - trade with the EU through a free trade agreement (FTA). 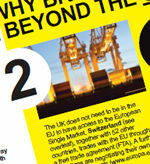 A further 73 nations are negotiating their own FTAs with Brussels (Europa.eu - February 2013). The claim that a 'business as usual' free trade agreement would not be on offer to the UK after we leave the EU is a blatant scare story. As a signatory to the World Trade Organisation, an independent Britain would be protected from discriminatory high tariffs because of the Most Favoured Nation principle, one of the cornerstones of the WTO system. The WTO is rendering customs unions like the EU redundant by reducing tariff barriers across the world. 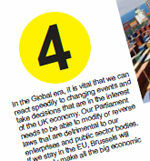 Yet the EU's regulations are applied to all our firms regardless of whether they export to the EU Single Market or not. Brussels now accounts for approximately half of all our internal, national legislation (Research Paper 10/62 - House of Commons Library, October 2010). In the global era, it is vital that we can react speedily to changing events and take decisions that are in the interest of the UK economy. Our parliament needs to be able to modify or reverse laws that are detrimental to our enterprises and public sector bodies. If we stay in the EU, Brussels will ultimately make all the big economic decisions for us. Britain now has only a 12.6% share of the votes in the Council of Ministers, 9.7% of the votes in the European Parliament and zero votes in the European Commission, which has the sole right to initiate EU laws. So we have very little opportunity to influence the laws they make. It therefore makes more sense for us to leave, accept the product regulations necessary to export into the Single Market (just as we do when selling our goods and services to all other economies), play a more direct role in influencing those regulations at the global level where they are increasingly made and decide for ourselves our own domestic legislation. (Table 3.B, EU Finances 2012, HM Treasury - July 2012). Within the next three years, the EU will become even more politically centralised as Brussels acquires a range of new powers in a bid to save the euro. Eurozone countries will then vote as a single bloc and be able to impose new job-threatening measures on the UK economy. Our politicians must stop being 'little Europeans' and instead focus on developing our trading and political links to the Commonwealth and other faster developing parts of the world. Scaremongers on Britain's membership of the EU peddle false claims hoping to psychologically intimidate voters into shutting their minds to the possibility of change and prevent a rational debate on Britain's future taking place. the risk of being overly bound to a European market in long-term decline. the authors of the report from which the claim arose originally have since contradicted it and dismissed the EU lobby's spin that jobs would be lost as "pure Goebbels"
the EU's trade surplus with the UK meaning disruption to business would be extremely counter-productive. Viewed from the EU angle, due to that trade surplus 6.5 million EU jobs are linked to trade with the UK. Ahead of a looming EU referendum, this pamphlet is the start of a new fightback to confront and dismantle the claims of Britain's increasingly active and well-funded EU lobby; a powerful exposé of the flaws in the pro-EU case and demonstration of how, far from being 'isolated', outside EU political integration Britain will be more free to grow our global trade and participate in international decision-making. It makes the forward-looking, truly internationalist case for Britain leaving the EU and shows how being locked into EU membership is holding Britain back from taking the action we need to prosper in today's smaller, faster-moving, 21st century world. Our thanks to Martin Haslam, whose involvement and support both improved this paper and enabled its wider distribution.